You’ve probably had edamame before. You probably sucked the beans out of the thick, salted pods to stave off hunger pangs before a big sushi dinner. You might have even eaten the soybeans in a salad. But there’s so much more you can do with them. You’ve probably had edamame before. You probably sucked the beans out of the thick, salted pods to stave off hunger pangs before a big sushi dinner. You might have even eaten the soybeans in a salad. But there’s so much more you can do with them. Here, 10 delicious, inventive ways to use edamame. This silky soup is a simple puree of onion, edamame and chicken stock. This risotto was created with chef Jeff Smith’s daughter, Isabelle, tossed some Laughing Cow cheese into a pot of risotto. The cup of Budweiser beer is his own addition. For a clever riff on the classic creamed peas and onions, this dish also includes edamame and panko. Sweet, crushed and sizzled soybeans make a terrific crust for flaky sea bass. 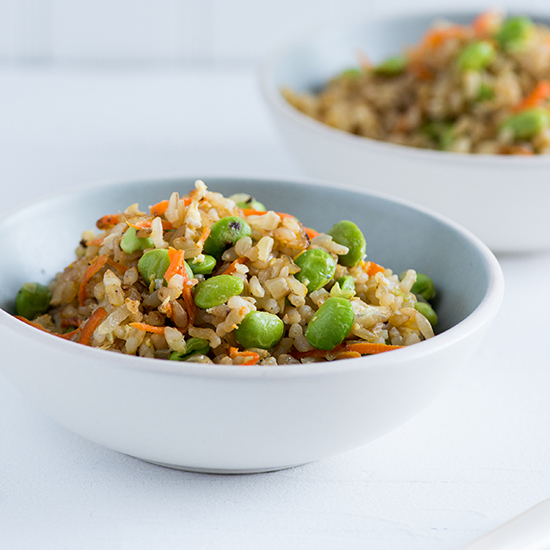 Edamame is a great addition to this healthy fried brown rice dish. Every component of these quick and easy shrimp tacos is packed with flavor. This delicious Asian-inspired chicken salad is stuffed with spicy Sriracha chicken and healthy edamame. Ginger really livens up this healthy vegetarian stir-fry. This great vegetable sauté comes together in just 15 minutes.